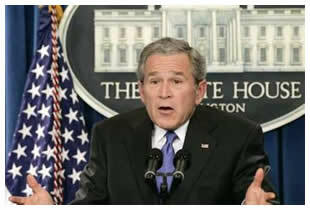 Goodbye President Bush, History will Remember You For..
What will be George Bush's greatest legacy in decades to come ? The Iraq War ? - “You‘re free. And freedom is beautiful. Any, you know, it'll take time to restore chaos and order – order out of chaos. But we will." Yes, many decades from now George Bush will be remembered more for his bushisms than any single one of the litany of disasters. "You know, I'm the President during this period of time, but I think when the history of this period is written, people will realize a lot of the decisions that were made on Wall Street took place over a decade or so, before I arrived in President, during I arrived in President." What's your favourite bushism? Post below.